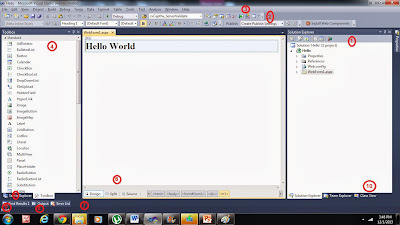 Microsoft provide very rich user interface for developers . 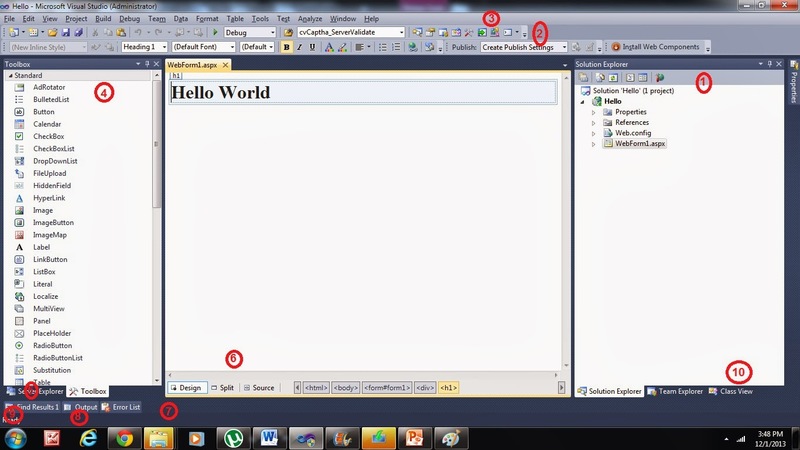 So that they can work very smoothly with the Visual Studio. MS provide very handy and useful tool to manage the application. I am going walk through only the 10 useful feature of VS 2010 product that helps to understand the GUI of the VS2010. 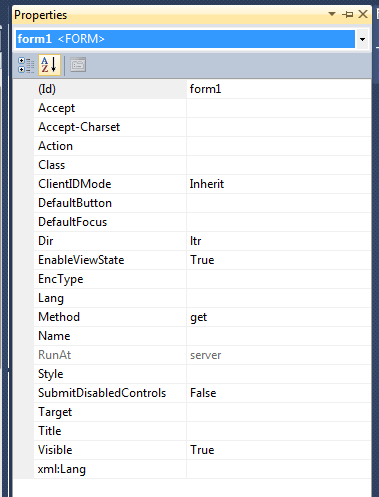 This 11 Visual Studio 2010 feature generally we look into our day to day work. It’s very important to understand. Please find in the image and link with the numbers. 1. Solution Explorer: it used to explore the list of project , files and folder in your application. It displays the list of files in tree view. 2. 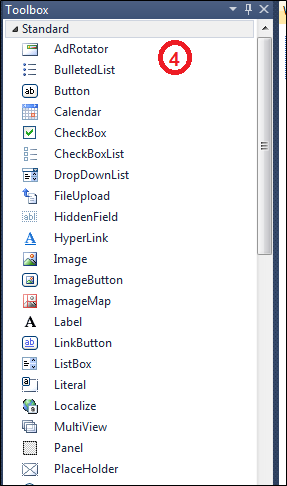 Tool Strips : it contain the list of tools icons which easy to excess in your application it contain many item from left to right 1st line like Open, Save, Save all, cut, Copy, past, undo, redo, Last Change, Next Change, Run, run mode (debug or release) and list of other window. 3. Menu Items : it contain the list of many items like File ( all file related items), Edit (editing content related like copy, cut, paste, undo, redo etc), View (to view different window), Build (building application related like build one page, build whole solution, build project , stop build etc), Debug( debugging application related, put break point, step over etc), Team, Data etc. 4. Tool Box : It shows the list of the tools that use can use in your application like textbox, lable, button, checkbox and many other tools. It divide into different sections (standard, data, Validation etc ) according to tool. 5. 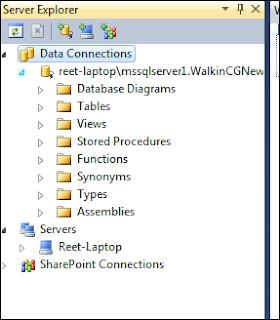 Server explorer : It shows the list of data base server or other server which you have connected. 6. Page View: it helps to get the different view of your HTML page. It is having three sections. Design, Split and Source. With Design you can view how your page will display in browser, Source you can see the source code of your page and with Split view you can see both the source and design view. 7. Error Window: it will show you the list of error on you code it shows the warning as well with error, there is flip flop button to view or hide the warnings. 8. Out Window : Give the overview of your project execution, once you run the application it give the detail as your application is executed successfully or failed. If it is failed how many error or warning exist. Like in given image. 9. Find Result: It show the list of result which you find to get in your whole application, to open find window click on ctrl + shift + f, it will open the find window, I searched there as str, than it will display result as. 10. 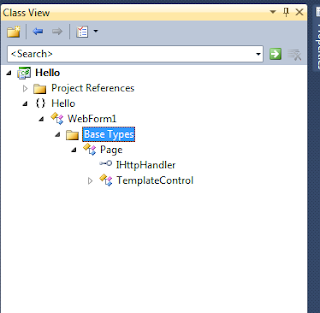 Class View : It used to display the class hierarchy, how and which call is calling. How many interface over there, how many methods over there like wise. 11. 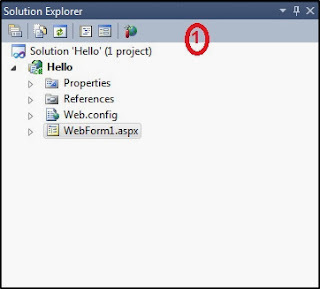 Properties: This I have never mention but this is very important window , by this window you can change the property of your controls and page of your HTML page window. It only work for HTML.